Trump was a reality-TV star before he became president, filming for hundreds of hours over the 14 seasons that he hosted "The Apprentice." In addition to the hours of footage that were used in the final product, there were countless hours of outtakes that never made it to air, and the tapes have earned something of a mythical status. Rumors have swirled since the election about what the outtakes could contain, and the speculation re-entered the spotlight this week as the show's former villain Omarosa Manigualt Newman added new fuel to the flame. She says that the tapes include one where Trump uses the N-word, though Trump has repeatedly denied that accusation. Here is a rundown of the mystery of the alleged Trump tapes. On Oct. 7, just a month before the election, the Trump campaign was rocked by the release of an old audio recording of Trump, but it wasn't an outtake of "The Apprentice." The tape was from a 2005 appearance Trump made on "Access Hollywood," and during some off-camera moments that were recorded, Trump is heard having a lewd conversation with host Billy Bush about groping women. The tape marked a low point for the contentious campaign, and Trump released a filmed apology the next day. "Anyone who knows me knows these words don't reflect who I am," he said in the video posted to Facebook on Oct. 8. "I said it, I was wrong and I apologize." That same day, Bill Pruitt, a former producer from "The Apprentice," hinted that the "Access Hollywood" tape was not alone in showing a different side of Trump. "As a producer on seasons 1 & 2 of #theapprentice I assure you: when it comes to the #trumptapes there are far worse. #justthebegininng," he tweeted. Chris Nee, a television producer who didn't work on "The Apprentice," posted a now-deleted tweet that was reported on widely at the time, including by Politico, saying: "Hearing from producers/crew N word is the ‘much worse.’"
Any outtakes from "The Apprentice" were owned by Mark Burnett's production company, which is owned by MGM. MGM and Mark Burnett released a joint statement Oct. 10, 2016, saying it is technically up to MGM and the terms of some of its contracts whether any footage could be released. "Despite reports to the contrary, Mark Burnett does not have the ability nor the right to release footage or other material from The Apprentice. Various contractual and legal requirements also restrict MGM’s ability to release such material," the joint statement said. The statement also addressed "recent claims" that Burnett threatened a lawsuit against anyone who is able to leak any questionable material, saying those suggestions are "unequivocally false." Three days later, another possible clue about the contents of the outtakes came to light as it was reported by The Daily Beast that rapper Lil' Jon, who was an Apprentice contestant, said he was called "Uncle Tom" by Trump during filming. According to the article, the rapper dressed up as Uncle Sam for one of the show's challenges and, instead of referencing the patriotic character, Trump called the musician "Uncle Tom," a derogatory term for African-Americans seen as acting subservient that originated from the abolitionist novel "Uncle Tom's Cabin." "All-Star Celebrity Apprentice" Season 13 conetstants are pictured with Donald Trump (center). Lil' Jon confirmed the incident, putting a statement out on Twitter: "When this 'Uncle Tom' incident happened on "Celebrity Apprentice" in the boardroom several of my castmates and I addressed Mr. Trump immediately when we heard the comment. I can't say if he knew what he was actually saying or not, but he did stop using that term once we explained it's offensiveness." The alleged tapes came back into the news cycle in December of that year, a month after Trump won the election. Comedian and actor Tom Arnold told a radio show that he had seen a tape that showed Trump using any number of slurs, including the N-word. "I have the outtakes to ‘The Apprentice’ where he says every bad thing ever, every dirty, every offensive, racist thing ever. I have that," Arnold said to KIRO Radio on Dec. 21, 2016. When asked by the host why the tapes never leaked, Arnold says it was because no one expected Trump to become president. "I’ll tell you why. Because when the people sent it to me, it was funny. Hundreds of people have seen these. It was sort of a Christmas video they put together. He wasn’t going to be President of the United States. It was him sitting in that chair saying the N-word, saying the C-word, calling his son a retard, just being so mean to his own children. Oh, this is so funny, this is this guy," Arnold told KIRO. Arnold said a Hillary Clinton confidante called him the Sunday before the presidential election, imploring him to make the tapes public. "They said, ‘I need you to release him saying the N-word.’ I said, ‘Well, now these people – two editors and an associate producer — are scared to death. They’re scared of his people, they’re scared of they’ll never work again, there’s a $5 million confidentiality agreement,'" Arnold said on the radio show. After that interview aired, Arnold tweeted that his wife said their home phone had a voicemail "from Trump Camp about defamation suit so it's on! Open Apprentice vaults 4 discovery! Miss Universe too!!" For his part, Arnold is now promoting a show he is hosting on Viceland called "The Hunt for the Trump Tapes With Tom Arnold." Arnold alleged that the video he referenced was not a physical tape but was sent via a now-expired link and he no longer has access, according to a recent interview in Rolling Stone. Before the release of her book, Manigault Newman shared excerpts of her book, including one where she wrote that she had spoken to "three sources in three separate conversations [who] had described the contents of this tape." "They all told me that President Trump hadn’t just dropped a single N-word bomb. He’d said it multiple times throughout the show’s taping during off-camera outtakes, particularly during the first season of ‘The Apprentice,'" she wrote, according to an excerpt. Political consultant Frank Luntz tweeted Aug. 10, that he was included in her book, with Manigault Newman allegedly claiming "to have heard from someone who heard from me that I heard Trump use the N-word. Not only is this flat-out false (I’ve never heard such a thing), but Omarosa didn’t even make an effort to call or email me to verify. Very shoddy work." On Aug. 13, Trump himself weighed in, denying ever having that word "in my vocabulary" and slamming Manigault Newman. ". @MarkBurnettTV called to say that there are NO TAPES of the Apprentice where I used such a terrible and disgusting word as attributed by Wacky and Deranged Omarosa. I don’t have that word in my vocabulary, and never have. She made it up. Look at her MANY recent quotes saying such wonderful and powerful things about me - a true Champion of Civil Rights - until she got fired. Omarosa had Zero credibility with the Media (they didn’t want interviews) when she worked in the White House. Now that she says bad about me, they will talk to her. Fake News!" Trump wrote in two tweets. That same day, Katrina Pierson, who served as a spokesperson for the Trump presidential campaign, was asked about the alleged campaign call during an interview with Fox News, and she said "that did not happen." 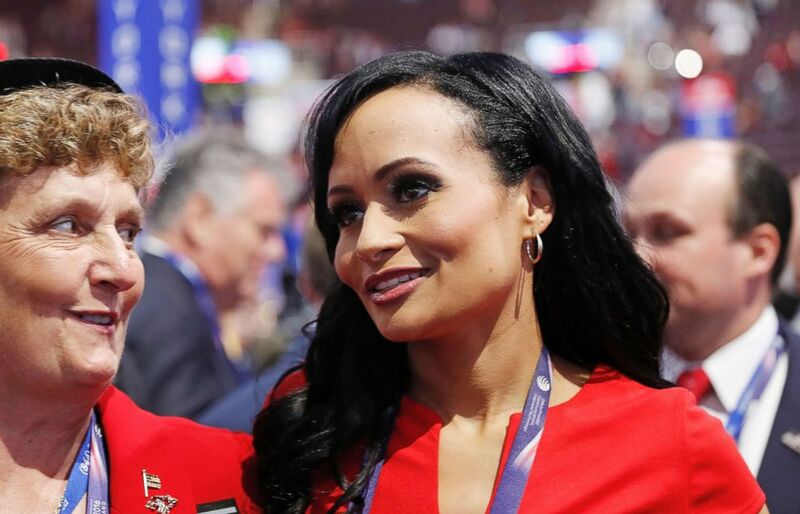 Republican Presidential Candidate Donald Trump spokeswoman Katrina Pierson, right, talks with delegates on the convention floor during the final day of the Republican National Convention in Cleveland, July 21, 2016. That same evening, Lynne Patton, a former event planner who worked for the Trump family who now works as a regional administrator for the Department of Housing and Urban Development, issued a statement saying that "at no time did I participate in a conference call with Katrina Pierson advising me, Jason Miller and Omarosa Manigault-Newman that Frank Luntz had heard President Donald J. Trump use a derogatory racial term - a claim that Luntz himself has also denied." The next morning, Manigault Newman shared another tape on CBS, one that was allegedly recorded an undated point during the campaign where both Pierson and Patton are heard talking about conversations they had with Trump about the alleged tape. 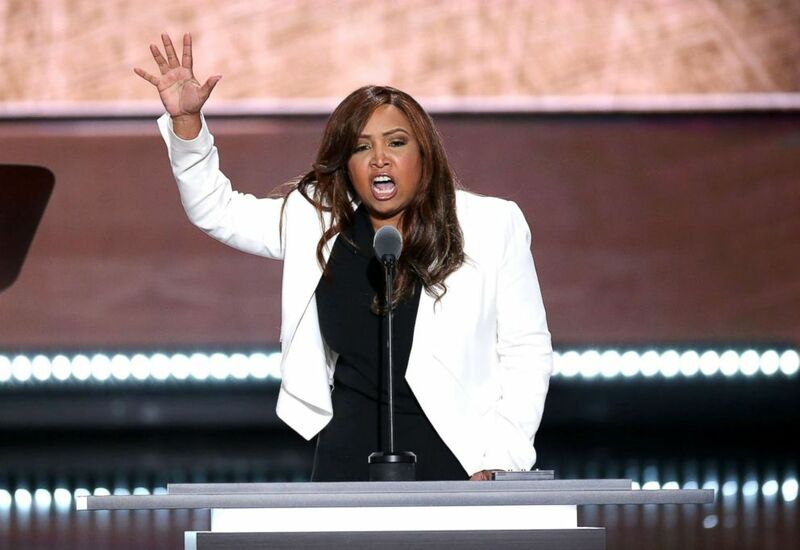 Lynne Patton, vice president of the Eric Trump Foundation, speaks during the Republican National Convention in Cleveland,July 20, 2016. Pierson is heard in the recording saying "he said it, no, he said it. He's embarrassed." After the CBS interview, Pierson and Patton released a joint statement saying that the recording doesn't show that they had any confirmation about the alleged tapes. Luntz tweeted again after the CBS interview, writing: "I repeat: I’ve never heard Trump (in-person or on tape) use the N-word. Anyone who claims otherwise is spreading #FakeNews." Pierson released another statement later that same day, placing the blame on Manigault Newman. “During the 2016 campaign, we heard rumors about an alleged tape from 'The Apprentice.' It’s clear now that those rumors were always being circulated by Omarosa and her alone. In her secret tape recording of me, it was one of many times that I would placate Omarosa to move the discussion along because I was weary of her obsession over this alleged tape. To be clear, I never organized a conference call with Jason Miller to confirm Mr. Trump said anything. That discussion was nothing other than sifting through unconfirmed rumors regarding the Apprentice tape and the transcript supports my statement. Omarosa fabricated the story by conflating numerous discussions," Pierson said in her statement. During a White House briefing Tuesday, press secretary Sarah Sanders came to Trump's defense and said that she has not heard him say the N-word. "I can certainly say I’ve never heard him use that term or anything similar," she said. When asked whether she could guarantee that no recording of Trump saying the word would appear, she was less decisive. "I can’t guarantee anything, but I can tell you that the president addressed this question directly. I can tell you that I’ve never heard it. I can also tell you that if myself or the people that are in this building — serving this country every single day, doing our very best to help people all across this country, and make it better — if at any point we felt that the president was who some of his critics claim him to be, we certainly wouldn’t be here," Sanders said.